How does one identify a good security cabinet? From a construction point of view, security cabinets for holding documents and rifles are similar to free standing safes, but with some important differences due to their size and their specific purpose. How does one choose a security cabinet which best suits one’s needs? Let’s consider some important aspects. The case must be made of steel and have a thickness which guarantees its resistance to possible attacks. For the most common uses a thickness of 1.5 mm is recommended, whereas if one wants additional security it is possible to reach a thickness of 3 mm, as in the Viro armoured rifle cabinet. The case, front panel and door of the Viro armoured cabinet has a greater thickness. The case must be fitted with holes to allow the cabinet to be fastened to the wall and/or floor. In fact, even though their weight might be enough to prevent their removal, it is recommended that security cabinets be fixed to the wall using anchor dowels, just the same as for free standing safes. It is important that the anchor dowels are very large and fitted with pull-resistant tabs, and that they provide maximum resistance according to the type of wall. A chemical anchor dowel is recommended. The photo showed a fixing hole for a security cabinet. Material and thickness. Obviously, the door must also be made of a strong material, such as steel, and it is worth having a thickness greater than that of the case. 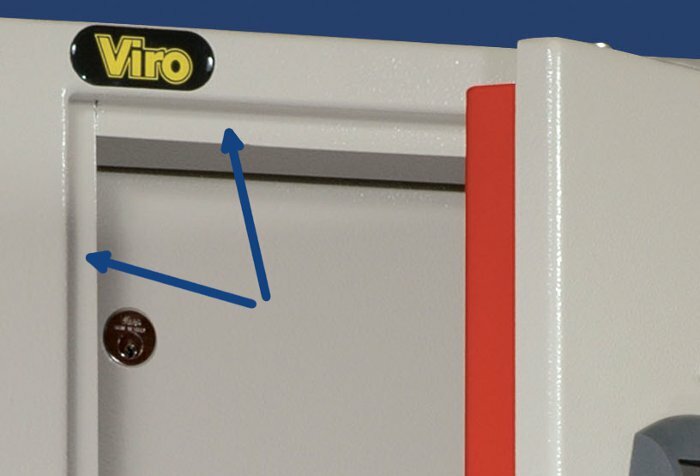 The front plate of the doors of Viro cabinets are 2mm thick, and this increases to 6mm for armoured cabinets. Hinge side is pull-resistant, so as to protect against attempts to pull the door off with a lever. Hinges. In order to resist unhinging and breaking in it is essential that the hinges are also manufactured with excellent quality steel, are sufficiently large and are joined to the case and the door with strong welds. Even the pins of the hinges contribute to the overall strength and they must be made of large diameter steel (for example 7 mm). Attack-proof ledges. Just like the doors of safes, the doors of security cabinets must also rest along all sides on special attack-proof ledges made in the frame. With regard to the frame, this, unlike those of safes, is typically made using the same sheet of steel with which the case is made, and appropriately bent. 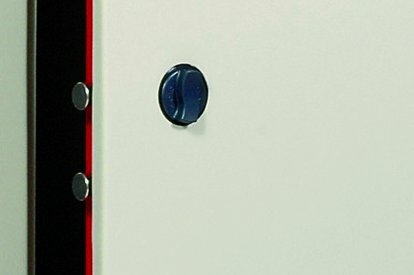 However, when additional security is required, even cabinets can be fitted with frames with an increased thickness welded on the front, just like safes. Again, this is so for the Viro armoured cabinet which has an 8 mm thick frame. The arrows indicate the attack-proof ledges present on the frame of a Viro cabinet. Opening knob. If the cabinet is electronic and it is fitted with an opening knob, it is important that this has a programmed breakage point, so that if an attempt is made to force open the cabinet by forcing the knob this breaks without damaging the internal mechanism and without leaving space for the introduction of any burglary tools. The knob of a Viro security cabinet. Regardless of the type of lock, whether it is mechanical or electronic, in order to guarantee the resistance to attacks it is important that the internal mechanical is made completely of steel, without any plastic parts. Given the significant size of the door, it is important that there are dead-bolts on all the 3 sides without hinges. 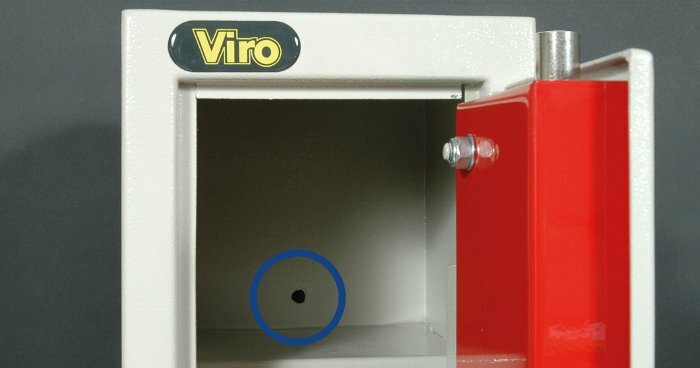 The circles highlight the dead-bolts present on the 3 sides of the Viro security cabinets. If there is a display, the back of it must be protected by a steel plate, to prevent access to the internal mechanisms with burglary tools if the display is detached. The electromagnet which controls the movement of the dead-bolts must be protected by a steel plate, to prevent it from being activated unlawfully simply by drilling a hole in the door. To ensure that it can also be used by the visually impaired, the keypad of the electronic locks must also be provided with Braille references and audible confirmation of commands. In this blog we have seen the construction features which guarantee the resistance of a security cabinet to attacks. In the next blog we will look at the differences in the interiors of the various types of security cabinets (rifle cabinets, document holders and modular cabinets). This entry was posted in Safety cabinets and tagged technology on 16 February 2015 by Mara Rossi.